A'ngela is a very cute and smart little girl with a big heart. She maintains A's and B's in school and she enjoy playing outside and riding her bike. She stated that her favorite foods are chicken and pizza. A'ngela's favorite colors are pink and purple. She is also a member of a sibling group. She has an older sister named Teneisha in which she is very close to and they desire to be adopted together. Teneisha is a beautiful young lady and with great personality. Teneisha enjoys reading, singing and traveling. Teneisha maintains all A's in school and states when she grows up she wants to be a lawyer. Her favorite foods are chicken and pizza. Her favorite colors are pink and purple. 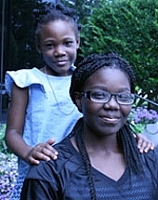 Overall these are two smart amazing sisters with a very close bond and would love to maintain their family connection. They both are searching for a forever family who are willing to provide them with love and care.